You’d think that all of the running around the house would be a great way to lose weight after you have kids. Sadly, this isn’t always the case. A lot of people keep the weight they gained during pregnancy, especially if they stopped exercising while heavy with child. The extra pounds can then be quite challenging to lose once the baby arrives, what with all of the tasks that come with being a newborn parent. Bouncing back on the fitness train shouldn’t be a difficult feat, though. With products like the best double jogging strollers, you can easily take your little ones with you on your runs. Designed for small kids of about the same age and weight, these products will let you accomplish tasks that are for your self-improvement, without sacrificing your kids’ safety and well-being. Interested in getting a double jogging stroller? Here are a few of our top picks that you should definitely check out. While phil&teds has been around for more than two decades already, it’s still considered to be a growing brand in the US. Because of its innovative designs, it is consistently gaining the attention of parents worldwide, offering a great range of products that are not just convenient to use, but very useful as well. As the company is also known for catering to parents who want to keep their active lifestyles, you can be guaranteed that their buggies are meant to be taken out on light jogs. But what really compelled me to add this product to the list is its fantastic design. Made for newborns to older toddlers, it’s definitely something that your family will be able to use for quite a while. A quick swap of accessories and additions will give it a different functionality, so it’s very useful for growing families. What's Great About It: If you only need to know one thing about the phil&teds Sport Stroller, it should be its versatility. This product can be configured in 26 ways, giving you a lot of freedom in how to get your kids settled in. It can carry two infants, two toddlers, an infant and a toddler, or even a newborn and a toddler. You can turn it into a sit and stand, a travel system, or a pram. You can even use it for just a single child, letting you get maximum use out of this unit. 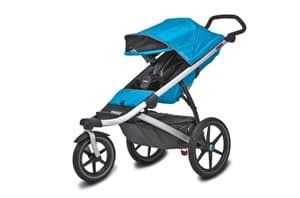 Hailed by many running enthusiasts as one of the best double jogging strollers, the Bob Revolution Flex Duallie is a no-brainer when it comes to double jogging strollers. It will be one of the first things you’ll find recommended in blogs and forums because of its time-tested quality and reliability. What makes a lot of people big fans of this product is its top-notch performance. Its maneuverability alone has won over lots of runner parents. As running with two kids can already be a major challenge in itself, you really can’t compromise your full control of the unit for anything in the world. The handlebar is easy to hold, even when you’re running, and it has a lockable swivel front wheel that will offer more control to your movements, whether you’re running or just walking. The all-terrain wheels are also a great plus, as they will allow you to take your little ones just about anywhere. What's Great About It: This stroller is designed for your little one’s comfort as well. It has a state-of-the-art adjustable suspension system, padded seats and harness, and air-filled, high-impact polymer tires. These guarantee a smooth ride, so you can be sure that your children won’t be bothered, even if you engage in a fitness activity while carting them around. Most parents who want to go back to running after having kids worry about how hard it will be to push kids in their stroller and still get a good workout. As regular strollers aren’t always easy to maneuver, a double stroller sometimes means double the trouble. This is where the Thule Urban Glide 2 comes in, as it ensures ease of handling combined with convenience and your children’s safety, all in one package. 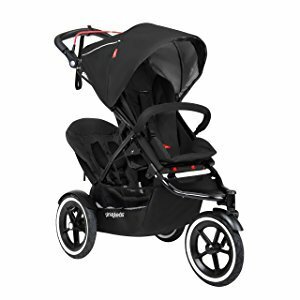 Well-loved for its sleek, modern design that looks and feels like it is substantially made, the Urban Glide 2 is definitely crafted for runners who also happen to be parents at the same time. It will let you focus on your run instead of fussing over the stroller, guaranteeing you a good workout. However, this doesn’t mean that it skimps on the necessities that your kids need. It can actually recline to an almost flat position, so you’re not compromising your little ones’ nap times, even if you take them out on a mid-afternoon run. What's Great About It: Most owners gush about how easy it is to push and how smooth the ride is. This makes it a perfect choice for both parents and kids, as it has nailed the very concerns that most runner parents have. It won’t be a hassle to take on runs, as it maneuvers like a dream, and with its hand-activated brakes, lockable swivel front wheel, and rear suspension, you can be sure that your little one will be safe and comfortable while you run. Managing two kids while you’re trying to work out can be more than just a handful. You won’t need complicated equipment to fuss over on top of all that. 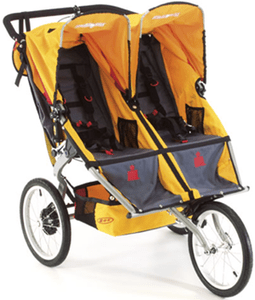 Therefore, for some folks, a double jogging stroller that’s easy to use and set up is a must. If that sounds like you, the Baby Jogger Summit X3 Double is something you should consider. Praised for its deep seat recline, travel system readiness, comfortable seats with mesh backing for breathability, large canopy, and all-wheel suspension system, you won’t have to think twice about whether your babies will feel comfortable being carted around in this stroller. It’s also very safe, with its 5-point harness, wrist strap, one-step parking brake, and handbrake, so you also don’t have to worry about your little ones’ safety while they’re on board. What's Great About It: Convenience is definitely what the Summit X3 Double is best known for. Featuring patented quick-fold technology, this product can be folded in just a single step. This means quicker setup and stashing away, helping you conserve more energy in the process. It’s a very convenient offering, especially if your kids tend to get quite fussy. It also has a handbrake that will give you better control of the unit while moving downhill and a remote lock for its front swivel wheel, making it even easier to use. It’s no secret that baby gear can get quite pricey. This is particularly true if you’re willing to pay for well-known brand names. However, that doesn’t mean that practical parents won’t be able to find excellent products that won’t break the bank. 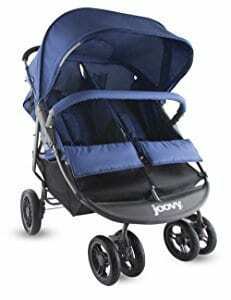 Take the Joovy Scooter X2 Double Stroller, for example. This is one excellent budget option for thrifty households, as it costs almost half as much as other competitors. 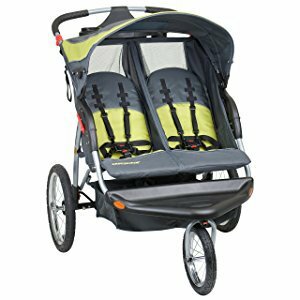 Despite its low price, it still is a decent option for a solid double jogging stroller. While it’s definitely not for vigorous runs on trails and uneven paths, it can do a good job on light jogs. It’s very stable with its four front wheels and promises easy maneuverability, whether you’re on a tile floor, concrete, or even grass. What's Great About It: The best thing about the Joovy Scooter X2 is the fact that it can fit in regular doors without having to fold the unit or get the kids walking. As it measures just about 30 inches across, you won’t have to spend minutes just to get in and out of a store, or even your house. Serious runners won’t let having kids slow down their lifestyle. In fact, most runners who have just started growing their families will find having two kids to be a good challenge, as the added child will mean additional weight for them to push. However, with the bigger challenge also comes a need to find a carrier that will do a good job in helping you cart your babies around. Bob’s Ironman Double Jogging Stroller is a famous option for serious runners, as it has been a top choice for many marathon and triathlon athletes over the years. The product's light weight, high quality, and smooth ride have been proven over and over, every time a dedicated parent wants to get their little ones in on the fun. So if you don’t want to settle for anything less than the best for your children, this jogging stroller is a solid option you should look into. 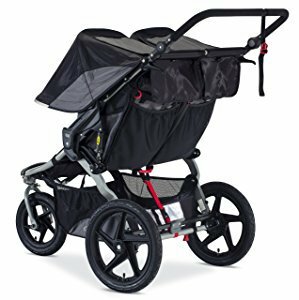 What's Great About It: There are tons of great things about this jogging stroller, as Bob really made sure that it has everything a runner parent requires and more. Its deep reclining seats have extra support and padding, are equipped with 5-point harnesses, and are travel system-ready. It has an adjustable suspension and lightweight pneumatic tires that guarantee a smooth ride. It’s also equipped with a fixed front wheel, so you won’t have to worry about the unit veering off while running at a fast pace. 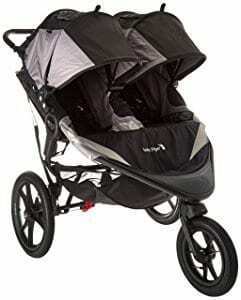 If you want the most affordable double jogging stroller that won’t compromise performance, quality, and safety, the Baby Trend Expedition Double Jogger is an option you shouldn’t miss. You’ll be surprised at how well this affordable product helps you get back in shape while keeping your little ones safe and comfortable, especially since its competitors cost up to four times as much. Like the more expensive models in the list, this Baby Trend product also has 5-point harnesses, multi-position seats, a locking front swivel wheel, a foot-activated rear brake, and a very easy folding mechanism. It doesn’t convert to a travel system, though, so if you have an infant that you want to take along with you on your runs, you might want to wait a while. What's Great About It: Aside from the very friendly price, this product is also loaded with lots of fantastic features that you might find very handy. Storage is one of its major offerings. Aside from a huge under seat basket, it also has a parent console that even comes with a built-in speaker. Imagine how fun your runs will be with the kids with some backup music to pump you up! I also love that it’s equipped with large all-terrain tires, letting you take on different surfaces for your exercises. While all strollers are designed to carry the weight of young kids, not all of them are capable of handling high speeds. Regular strollers, and even a good number of all-terrain varieties, are just not sturdy enough to provide ample support for children when pushed at a rapid pace. So, a jogging stroller is essential if you want to maintain your active lifestyle even after having a few kids. However, not all jogging strollers are made the same. Particularly when it comes to double jogging strollers, you have to be very particular in choosing the right product to take home. With so many options, you might be wondering how to begin your search. To help you out with that, here are a few very important things you need to remember when shopping for the best double jogging strollers. Running itself is not the safest activity there is. There are tons of risks, like twisting your ankles, falling down, and tearing a muscle, among many others. If you choose to become a runner, you should know all of these risks. Running with kids tends to amplify the dangers of running, as you don’t only have to pay attention to your form, balance, and where you’re going, but you have to expertly maneuver a stroller as well. Doing all of these at high speed, especially with two kids in tow, can be very tough, so you have to know how to play it safe. Age restriction is one of the most-emphasized safety precautions by runners for parents who want to bring their kids along on their runs. The best jogging strollers should also be equipped with several effective and useful safety features. A wrist tether will ensure that you always have the stroller within reach to prevent the unit from running away, falling, and crashing. A five-point harness will help protect your kids from the impact of falls, guaranteeing that they won’t be thrown out of the stroller and that the force will be distributed on their stronger bones, and not on muscles and joints. A locking front wheel offers better control in high speed, so even as you run, you can still maneuver and navigate the streets with precision and safety. We all know that babies are very particular about getting comfortable. As they don’t have the filter or capacity to put up with even the smallest inconveniences, you have to make sure that nothing is amiss and that they’re always in the best position. As running with young kids won’t exactly make them feel like they’re cradled, especially without a comfortable ride, your kids will surely get stressed out by the whole ordeal. This makes it very important for you to ensure that their stroller offers a smooth ride. As stress in young kids can be countered by extreme comfort, you should at least aim to cushion the bumps they’ll experience on your runs. A stroller with soft seats and ample suspension will also help, so make it a priority to find units that offer such. As double jogging strollers will have to contain two kids, it should have enough space to do so. This makes them very bulky, often taking up the entire sidewalk. If you only run in parks with low foot traffic, this shouldn’t be a problem. However, if you also run around the neighborhood, the large footprint of your kids’ stroller can be a hassle, not just for you, but for everyone else as well. People will have to dodge and make way for you and your little ones, which is something that not everyone will want to do. Unfortunately, there’s not much that you can do about minimizing your footprint. The most that you can do is to look for models that are smaller in width than others. Tandem strollers are definitely out of the question, as they’re not designed for running. Getting in shape even while raising a few kids is possible. By taking advantage of products like the best double jogging strollers, you can be off to a running start on your journey back to fitness. Take advantage of our tips and suggestions, and you might just find yourself back out there in no time.